One of my favorite authors is Louis Sachar. As a kid I laughed myself silly over Sideways Stories from Wayside School. And as an aspiring writer Holes blew my mind. The plot was so intricate it was almost sculptural. (And as a reader, Holes is just a really good read). SO, when The Cardturner came out, I rushed out to buy it. This was in 2010. It’s sat on my shelf for 5 years. To be honest, I think I was reluctant to read it because I loved Holes so much and I was afraid The Cardturner wouldn’t live up to my expectations. I finally bit the bullet and read it, and kicked myself for not doing it sooner. The summer holidays are looking bleak for Alton Richards. His girlfriend has dumped him for his best friend. He has no money, no job, and, if that wasn’t bad enough, his parents are insisting that he drive his great-uncle Lester to his bridge club four times a week to be his cardturner – whatever that means. Lester Trapp is old, blind, very sick, and very rich. But Alton’s parents aren’t the only ones trying to worm their way into Lester Trapp’s good graces. They’re in competition with his longtime housekeeper, his alluring young nurse, and the crazy Castaneda family, who seem to have a mysterious hold over him. Alton soon finds himself intrigued by his uncle, by the game of bridge, and especially by the pretty but shy Toni Castaneda. It’s a fun story, and while the plot may not be as complex as Holes, it did something else that was kind of amazing: It made me want to learn to play bridge. Sachar writes scenes of his characters playing bridge, like a fantasy writer writes a sword fight. It sounded fun and exciting and I’m seriously looking into Bridge Clubs in my area. 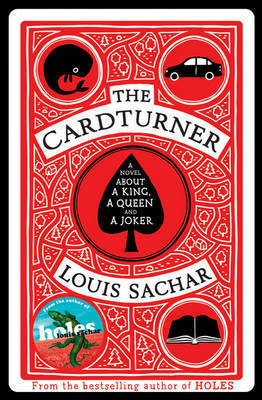 Holes will probably always be my favorite Louis Sachar book, but The Cardturner was a great read too and I’m so glad I finally picked it up. Holes will always be my favorite, but I’m really glad I picked up something new.